Hi there, not sure if you remember me but I built the One World Trade Center with brickstuff lights in 2017. I was thinking about tweaking the streets and plaza in the model, and I was wondering if it would be possible to get the traffic light with only the actual traffic light and the gray support rod.. could the rod be black? Also, is it possible to hang the traffic light upside down from the rod by the wires and reverse the light colors? I'm trying to come up with a way to clip the traffic light apparatus to one of my existing street lights as I am trying to match the real thing. Let me know if you think this is possible and cost as well as how quickly you could get me one. I am exhibiting my model at Philly BrickFest at the end of the month. Thanks so much! Hi Greg, of course I remember you! Were you looking for a full 4-way intersection? That's the kit we offer without brick-built parts-- i.e., just the LEDs and controllers needed to make the intersection work. If you had just the Pico LEDs, would you be able to fit them into your design? They do have the tubing in black, so making a black traffic light might be possible. If you had photos of your design that you could share, that would help. Hi Rob, thanks for getting back to me! Hope you are well. In preparation for Philly Brickfest, I wanted to make some improvements to my build, and I want to correct some stuff that has bothered me about the streets and the plaza. I thought a working traffic light might bring it to life more, but I am much more budget conscious this time around haha. I don't need a 4 way signal, just a one way programmed light. 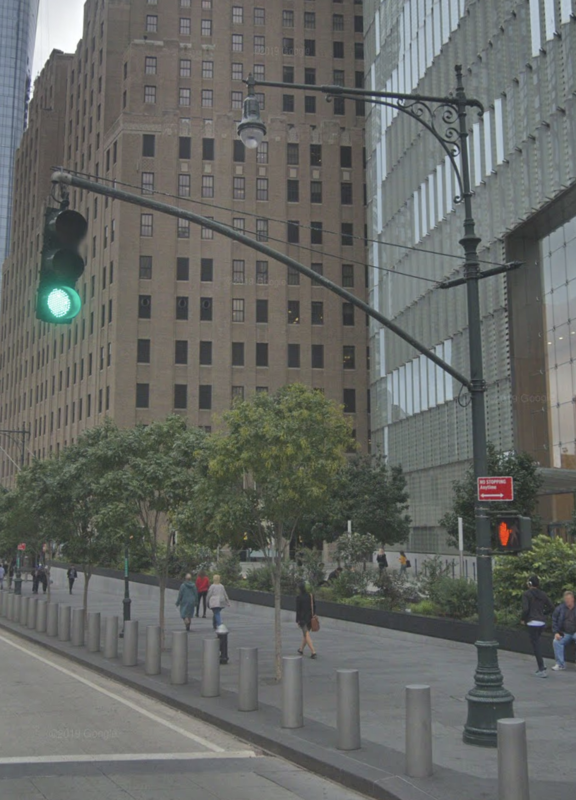 Below is one of my current street lights and a street view of the real intersection. The traffic signal extends off of the streetlight, do you have any ideas of how I can do this without breaking the bank? I'm actually out of the pico lights also. Let me know your thoughts, and thanks! Greg DiNapoli Hi Greg, thanks for the photo. It may be tough given your scale-- the smallest "official" stop light you can get using LEGO is a 1x3 brick, but given the scale of your street lights I think that would already be too large. If you needed something smaller, you'd have to get creative with cutting parts and using non-standard gels to cover each light. That's a lot of work, and I don't even know how it would look in the end. We can definitely provide the lights, but it's the housing I don't know about. I can't think of a way to make a housing on your small scale. If you have any ideas, let us know-- if you can make a housing, we can probably put lights in it! 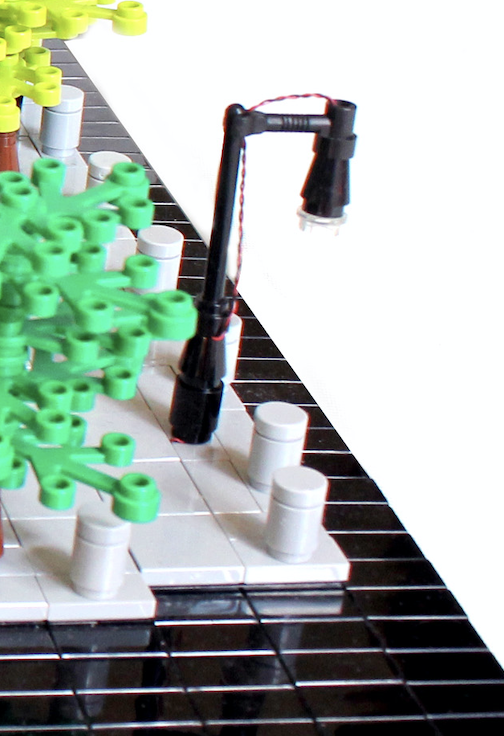 My attempt at this traffic light - at normal "LEGO" scale, is below. I went with a blinking single red Pico, but I wasn't trying to duplicate anything in reality. But yup, it'd still need to be roughly two bricks high - maybe two if you get creative with a 1x2 plate and cram all three Picos in there... and an extended wire for the picos to hide the daughter board(s) under the build or in a nearby construct. Greg DiNapoli what do you think? I thought it may also be possible to create a traffic light with three small LEDs mounted directly onto a 1x2 black plate. Would you be able to built a traffic light around that, and would you have space nearby to hide the control boards? Hi Rob, sorry I took so long to reply. I've been redoing the plaza of my 1 WTC and seeing what I could come up with. See the images below (I apologize for the crude mock up of my thought) do you think something like this is doable and can be done neatly? Perhaps mounting the red, yellow and green lights on a 1x3 black plate, and using a 4L or 5L bar clipping it to the existing streetlight. It looks like in your stock traffic light piece that you somehow fit the wires inside the bar? Let me know your thoughts on this, approximate cost and time frame if at all possible, I'm running behind schedule and I'd need it in about a week as Brick Fest Live Philadelphia where I will be displaying is April 27-28. If it's not feasible, no worries, it was just a feature I would have liked to have added. As always thanks for you help! Greg DiNapoli Hi Greg, thanks for the mock-up. That's pretty much what I had in mind. We could do it for you-- the only question would be: where would you have room for the controller board? You'd need a space about the size of a 2x4 brick to hide the controller board. We could make the LED wires long so if you had to put it say 24" or more away from the traffic light and run the wires under tiles, that could be done. Just let me know if you have space anywhere to tuck the board, and how long the wires would have to be to reach from the traffic light to the board. Thanks! Hey Rob, thanks! 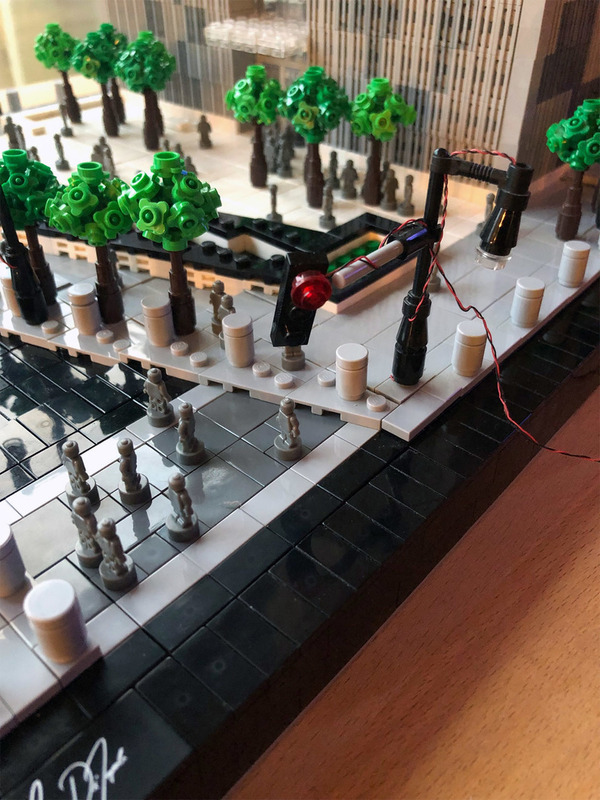 If you look at my most recent images, the wires would go from the traffic light under the gray tiles, and then under the trees of the plaza with the white tiles there is actually a pretty large space where I have the adaptor boards, and they connect to the power source in the center of the building. So the controller board will only be like 6" or 8" from the actual traffic light. And then I'd run a single wire from the board to the power source at the center of the building. Will the wires actually go inside the 4L/5L bar? What would the cost be? Do you have any thoughts on how to connect the 1x3 plate with the lights to the bar? In my mock its just hanging there, not sure if you had a better solution. Lastly, how quickly could you get this to me? Thanks so much Rob! 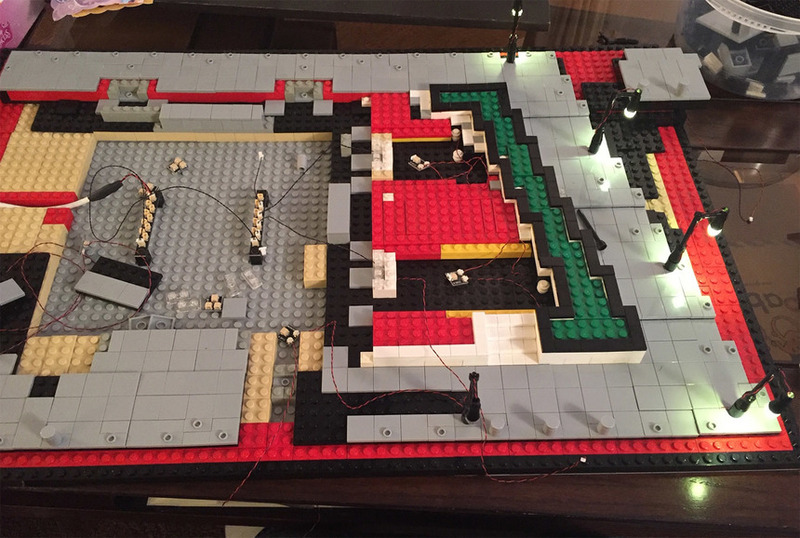 Just to give you as much info as possible, the below is a picture of the base wire layout from when I originally constructed it. The traffic light will go in the upper right corner. It wouldn't be an "official" LEGO attachment but I think it would work (you'd put the clip onto the end of the tube (pinch the ends of the tube into the clip). If you think this will work, I can send you a quote for the assembly. I'd use tubing instead of the light bluish gray bar you have to run the wires through. You could then run the wires down the side of the post and under your tiles. Alternately, if you wanted everything to be self-contained, I could make a new post for you that also used tubing, so you could conceal the wire for the Pico LED as well. I'd have to order some parts fro BrickLink for that, but it could be done. Let me know what you'd like to do, thanks! Greg DiNapoli Another idea would be to send me all of your streetlights and I could replace them with tubed versions and put the wires inside. That may be the quickest vs. me needing to BrickLink parts. Let me know, thanks! Rob Klingberg Hi Rob, thanks for the great ideas! 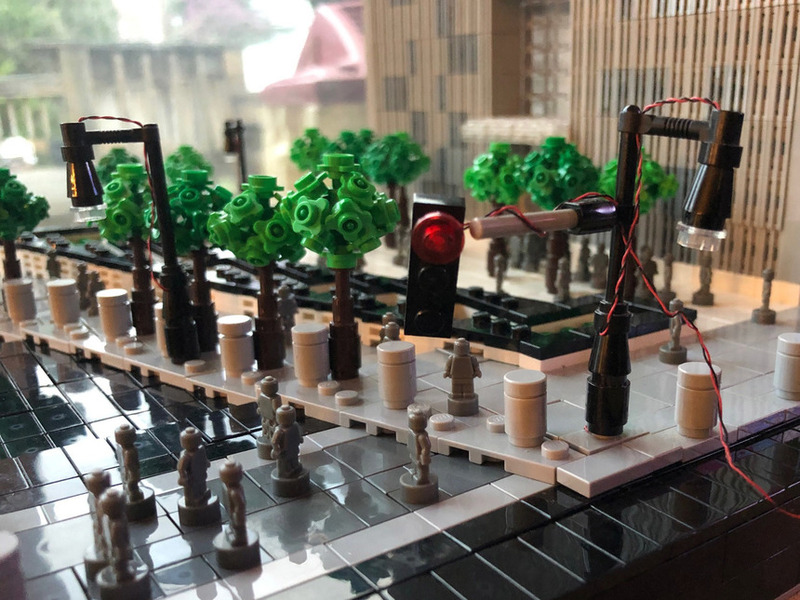 That could work for the traffic light, could you send me a link to the tubing you would use on bricklink? I would love to conceal the wires on all the streetlights, but I am getting concerned with timing. Is it something I could do myself with existing pico lights and the tube, or do you fit the wires in first and attach the plug/LEDs later (obviously I couldn't do that)? I would be concerned sending you my existing street lights only because if they happen to get lost or delayed in the mail I'd have nothing for my display next weekend. Do you think you could get the parts and assemble them and get them to me by next thursday/friday? If not, as tempting as it is, I might just stick with ordering the traffic light assembly from you. Let me know what you think. Also, for the traffic light, I would need all parts to be BLACK, I only used the gray bar because I had it laying around. Please let me know ASAP what you think. As always THANK YOU! Greg DiNapoli Hi Greg, to get the wires inside the tubes we'd need to run them before soldering the LED, so you wouldn't be able to it post-soldering. 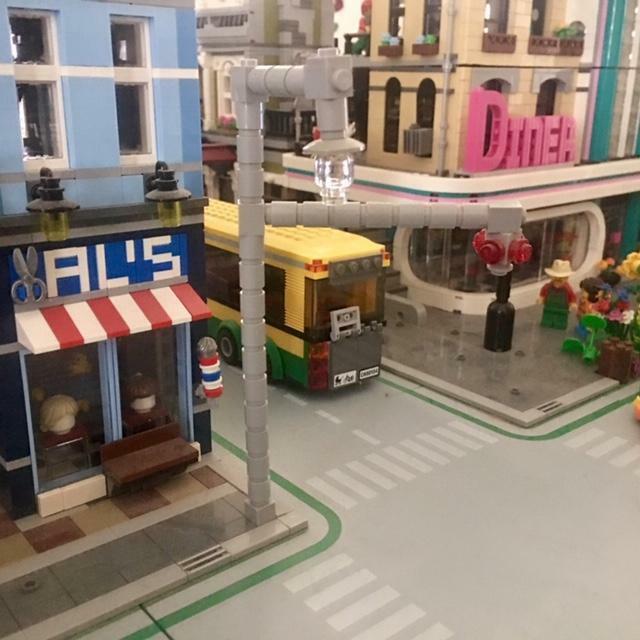 You're right, timing seems too tight-- do you have any of the LEGO part I listed above (to anchor the traffic light to the tube)? If so I can just make the tube, 1x3 plate, and stoplight assembly for you and you can just attach it to what you already have. Please let me know, thanks! Yes, I have the part you mentioned, I will take the tube, the plate and the stoplight assembly. How much will that cost and how quickly can you get it to me? I may also order some more pico lights once I see the cost for the traffic light. Thanks!! Greg DiNapoli Great. Cost for the traffic light assembly (plate + pipe + LEDs + 12" wires + circuit board) would be $32.99. I could get it out tomorrow most likely. If this works, let me know what else you'd like to order and I'll send a PayPal invoice. Thank you! Perfect. Can I also order 4 pico lights as well. Send me the invoice and I'll send payment tomorrow. Thanks so much! Greg DiNapoli Sure thing! Look for the invoice soon. Thank you.